She went from America’s richest to world’s most disappointing. Another day, another streaming project announced. Though we aren’t getting Joanne the Scammer’s life story yet, the tale of Elizabeth Holmes, who scammed the world into believing she was the next revolution in the healthcare industry and had become the “youngest and wealthiest self-made billionaire in America,” is on its way to Hulu. 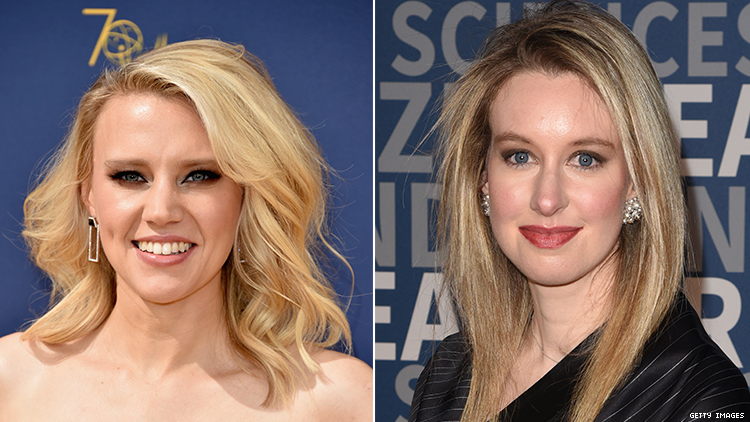 According to Deadline, the streaming service is closing a deal for a limited series titled The Dropout with Saturday Night Live’s Kate McKinnon slotted to play Holmes. Based on the ABC podcast of the same name, the 6-10 episode project will trace the story of Holmes and the now-defunct company Theranos, which was purported to revolutionize healthcare. The company supposedly would provide affordable bloodwork to all by using a much tinier blood draw, and providing personal machines. The promise, and Holmes’ hard work got the company valued at $9 billion, putting Holmes herself at a net worth of $4.5 billion. But it was all lies, my friend. All lies! News broke that Holmes’ research was unbacked, and that the basis of her discovery was all entirely false. In 2016, after having having ranked her at the top of their list of America’s Richest Self-Made Women the year before, Forbes revised her net worth to nothing. McKinnon will have a lot to work with, as Holmes is full of her own quirks and mannerisms. Called by some as “the next Steve Jobs,” she took to wearing black turtlenecks. But it’s more than just the fashion: she spoke with a lower voice, which many think was manufactured, and had a penchant for not blinking. Literally cannot wait to see one of the world’s most disappointing leaders portrayed on screen by SNL’s favorite, queer cast member. McKinnon will also executive produce the drama. For those now ready to consume as much Elizabeth Holmes content as possible, you’re in luck: in addition to the podcast, there’s an HBO documentary titled The Inventor: Out for Blood in Silicon Valley and a book titled Bad Blood. There’s no word on the premiere date for Hulu’s The Dropout.